Aldrich | Scuffalong: Genealogy. Aldrich – Scuffalong: Genealogy. Mound City Medical Forum gets ready. Pittsburgh Courier, 14 August 1937. This is the earliest photograph I have seen of my great-grandfather, and he was 51 years old here. His hair, fallen over his forehead, seems thicker than in later studio portraits. Otherwise, disappointingly little detail can be seen. 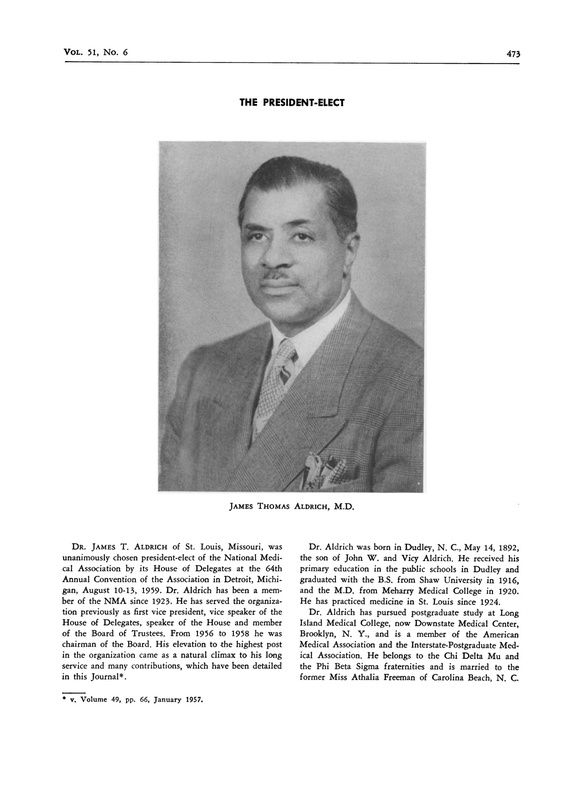 Twenty-four years later, he would be elected president of the National Medical Association. 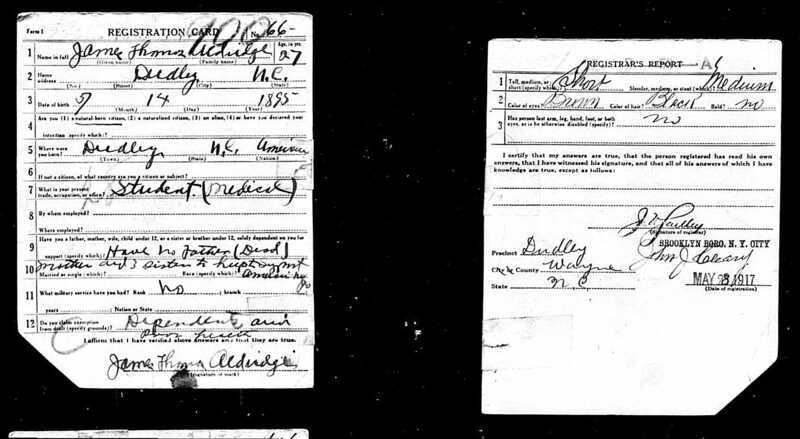 On 28 May 1917, James Thomas Aldridge appeared before a registrar in Brooklyn, New York. I imagine Tom dragging his feet, and his reluctance to serve shows through his notably exaggerated response to Question 9 — “Have no father (dead) Mother and three sisters to help to support” — and the basis for his claim for an exemption — “Dependents and poor health.” Tom described himself as a “student (medical),” and evidence demonstrates that he had entered medical school in the fall of 1916. 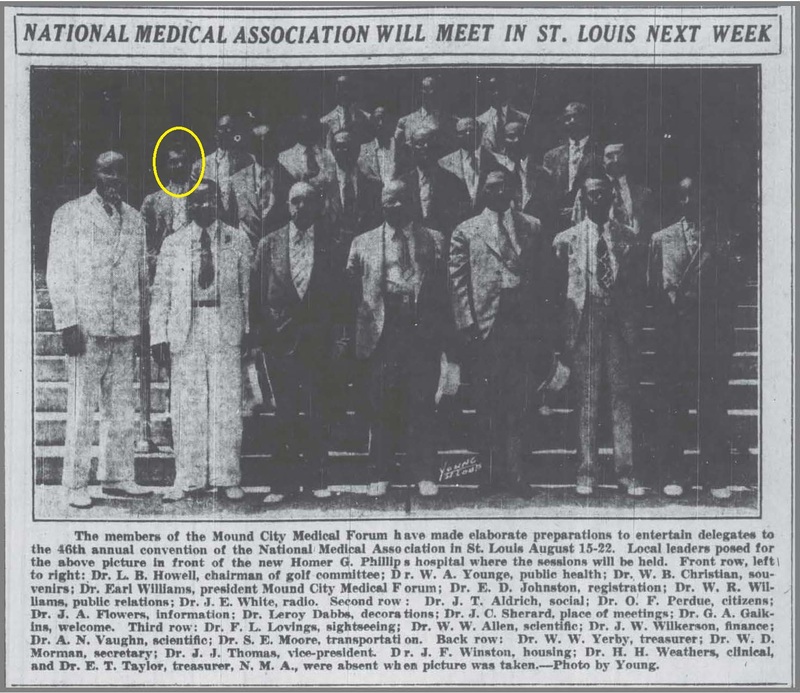 (He may have done his first year at Leonard Medical School, then transferred to Meharry, from which he graduated in 1920. But what was he doing in Brooklyn? He wasn’t a resident, as demonstrated by the home address and precinct listed on the card.) Tom also gave his birth date as 14 May 1895, which would have made him 22. His age, however, is listed as 27. Neither is correct. He was born in 1886, and was 31 in 1917, but always fudged heavily on his age, possibly to disguise the long years that passed between finishing eighth grade in Dudley’s local school and entering high school at Shaw. Either way, he was called up. Until a couple of days ago, my knowledge of my great-grandfather’s World War I service was limited to brief mentions in his obits that he had been in the Medical Corps. 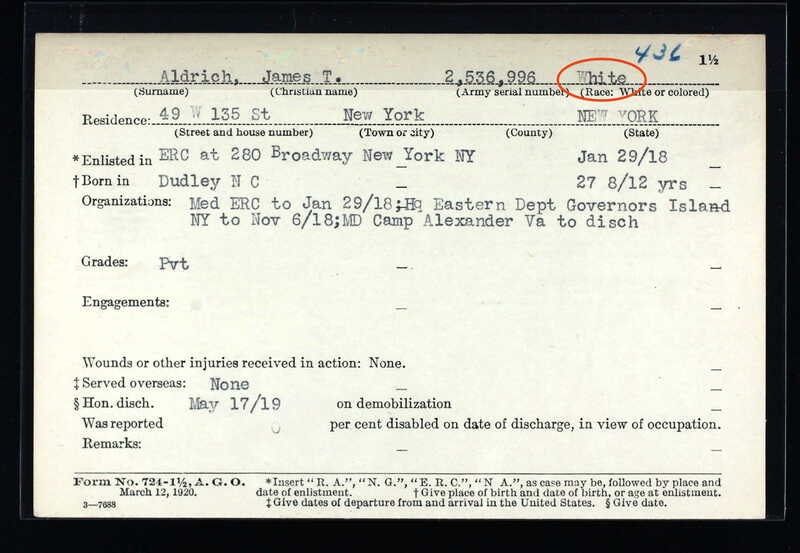 While looking for something else, though, I ran across an Ancestry.com database, “New York Abstracts of World War I Military Service 1917-1919.” And there, under his preferred spelling — more about that later — was James T. Aldrich. Huh? How ever did Tom pull that off? In any case, there it is — his World War I record. Service did not take him far from his home in East Harlem. (Maybe his health was poorish, after all?) Enlistment in the Medical Reserve Corps on Broadway in January 1918. Then about nine months at the Army base that Governors Island once was. (On 8 October 1918, just before leaving Governors Island, he married Athalia Freeman.) Then on to Camp Alexander in Newport News, Virginia, for six months until his discharge in May 1919. Camp Alexander, established in 1918, served as an embarkation and debarkation camp for African-American troops. A con man is back. [In 2012,] a man called (and for the life of me I cannot find the slip of paper on which I wrote his name and phone number) and stated that he was the illegitimate child of Thomas Aldrich. He was trying to find out information about his family and for some reason he found me because of [my husband.] He was born in 1954 to Thomas. His mother was a young, Jewish nurse at the hospital in which Thomas practiced. Thomas was very generous and left a trust fund for his son. Therefore, when he was murdered, his son was provided for. His son currently owns 5 hotels around the country, one in Chicago, one in Los Angeles, but I cannot remember the others. A welter of emotions overtook me. Wow. A long-lost great-uncle. A couple of times over the next eighteen months, I reached out to W. to prod her memory. In the meantime, I waited and hoped that Tom’s son would find me. Any Google search of my great-grandfather’s name will quickly link to me and my blogs, so I believed that there was a decent chance I’d hear from him. A couple of weeks ago, W. told me she’d remembered that the man’s name was Malcolm, but still could not recall more. The information was too thin for me to formulate a good search query, so I continued to wait. And then, this week, W. emailed to say that she’d suddenly remembered this man’s last name, had looked him up, and had been stunned at what she found. There was a photo, which did not seem to match the “nearly white” appearance he’d ascribed to himself. 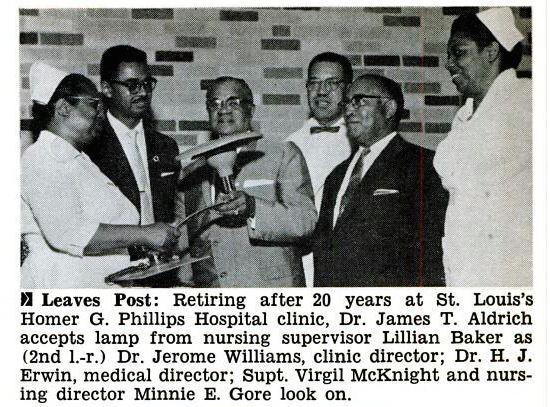 (Did the segregated Homer G. Phillips Hospital even have white nurses?) But the clincher: Malcolm Aldrich, alias Malcolm Couch, alias a hundred other names and Social Security numbers, is a convicted felon many times over, a defendant in dozens of lawsuits, a specialist in real estate scams and schemes and general fraud. While I was waiting for a hit on my blog, Saint Louis television statement KVOM was reporting this scandalous news. And then this. Lord. And see this from 2009. It is certainly possible that Malcolm Aldrich, or Couch, or whatever, is both the son of James Thomas Aldrich [Aldridge] and a shady slickster. Either way, I’m keeping my distance. 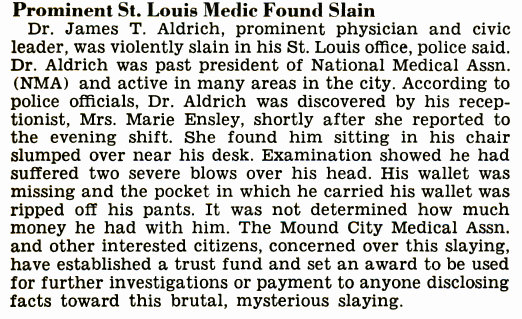 Dr. James T. Aldrich [born Aldridge] was my great-grandfather. Never mind what it says below, he was born in 1886. 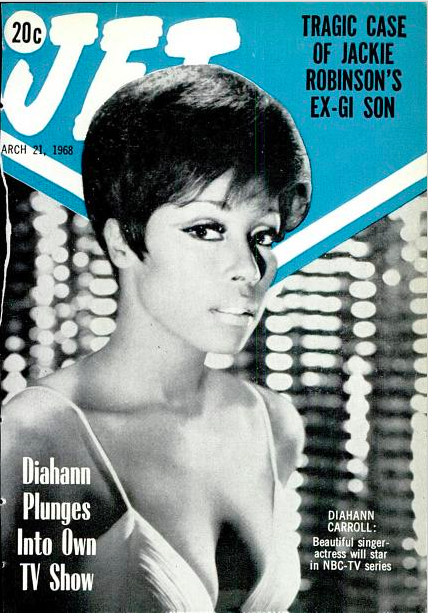 Journal of the National Medical Association, November 1959.